Hello and Happy Saturday!! I trust that you all had a fantabulous Valentine’s Day and are now recovering from the sugar, alcohol, and/or hugs & kisses overload? I was a good girl and ingested minimal sugar and alcohol, but there was no shortage of lovey hugs and kisses with my Valentine. This morning we’re up bright and early getting ready to head out for a boot camp in the gorgeous weather. But before we head out I have to share this great recipe with you…it’d be perfect for lunch today!! Doesn’t it make you wanna just lick your screen? Don’t do it though, there’s no telling what’s on there! But, do get ye to the grocery store and pick up the few ingredients you’ll need to make your very own! I made these for dinner this week with sweet tater fries, and it was delish! J took the first bite and I watched and waited for the reaction. I wasn’t too sure about the warm mango salsa on a burger…but he said it was really good. And then I tried it and confirmed. Mango salsa on fish, good. 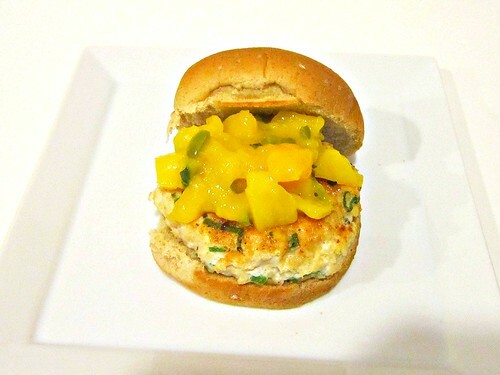 Mango salsa on chicken burgers, also good! Who’d of thunk it?! Well, someone did obviously since there’s a recipe out there, but you know what I mean! The sweetness of the mango goes really well with the jalapenos and the spice in the burger. And now it’s your turn to try it out!! In a medium bowl combine chicken, garlic, green onion, 1 tablespoons of jalapeno and salt, and mix until incorporated. Form 4-6 equal patties (make them a little larger than the size of your slider buns) and sprinkle both sides of each patty with blackened seasoning. Heat a large non-stick skillet over a medium-high heat and add 1 tablespoon of olive oil. Add the patties, in batches if necessary, and cook 4-5 minutes per side, or until cooked through. Meanwhile, in a small saucepan, combine the remaining 1 teaspoon of olive oil, mango, onion, garlic, and 1 tablespoon jalapeno, and vinegar. Bring to a boil over medium heat and then reduce to a simmer. Cook until mangoes begin to break down, about 5-8 minutes, stirring and breaking apart if necessary. Remove from heat and add any remaining jalapeno, cilantro, pinch of salt, and juice of lemon. Toast the slider buns if you like, top with a burger patty and a spoonful of warm mango salsa.